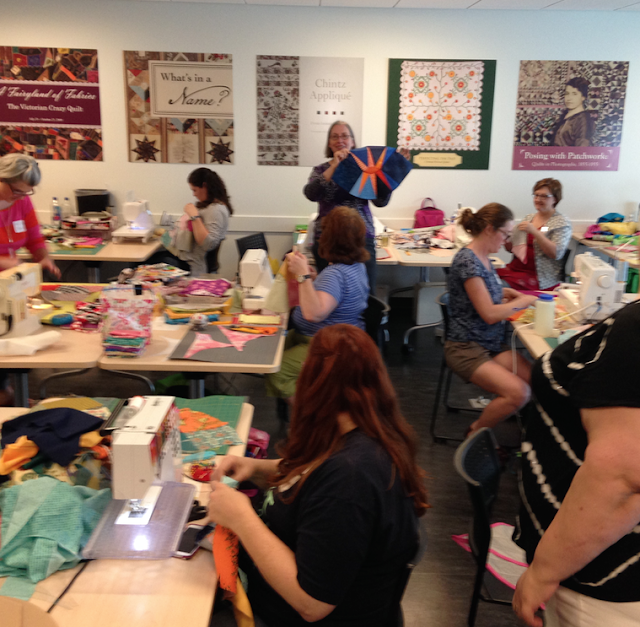 V Findlay Wolfe BLOG: Quilt House DWR class. Last Sunday, at IQSCM, after the board meeting and ribbon cutting fun, I taught a Double Wedding Ring class. This was my second time teaching at the Museum, and I have to say, they SPOIL ME ROTTEN! ( A Bag full of Nebraska goodies, AND A POLYESTER quilt top! ) Yes, I am probably the only one who gets excited over that! haha! 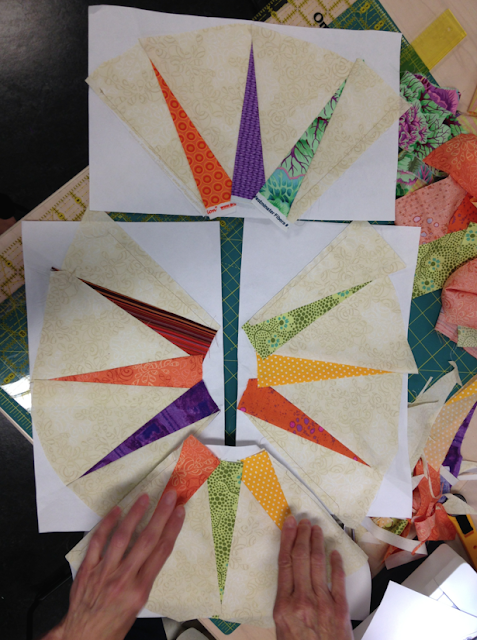 Different variations were going on at once, some were paper piecing, some where going scrappy, some were going with the Florid blooms look, and Fun and laughter was simultaneous! 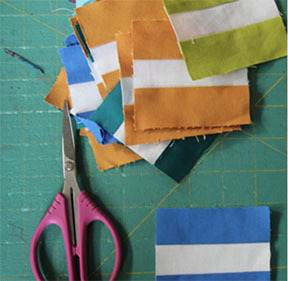 Real attention to what your fabrics are doing was being given, here she fussy cut her points, and her stripy background fabric so the directions were all the same, I love details like that! 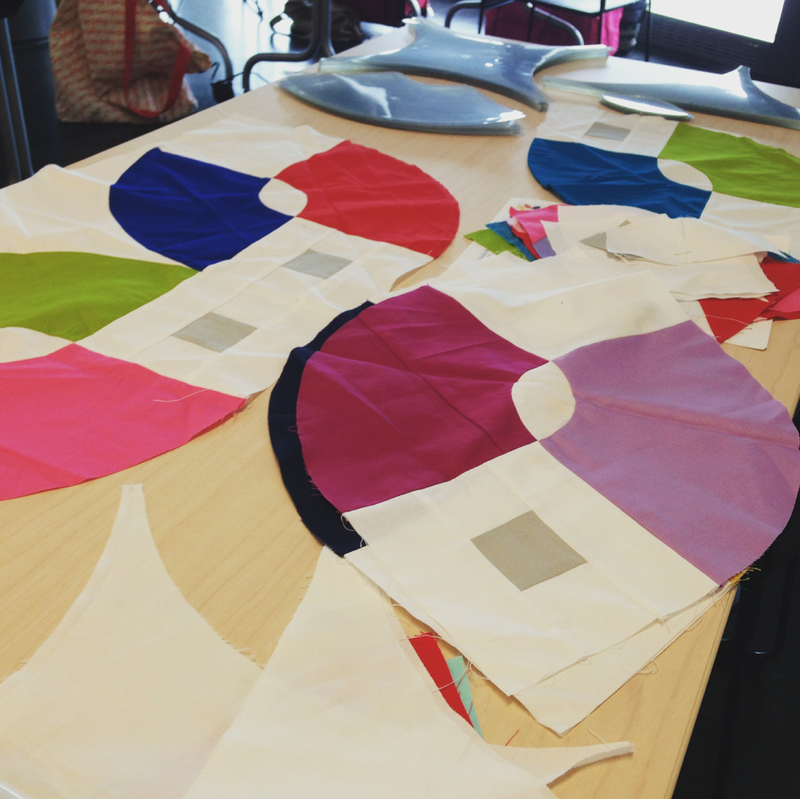 Get more movement by looking at your fabrics and letting the fabrics do the work for you! Having a Inspiration fabric to set the mood! 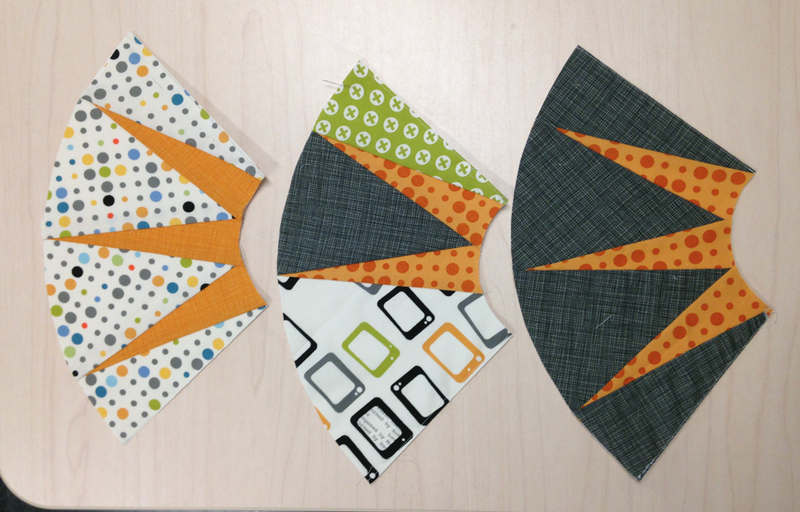 Here her concave squares fabric (Alex. Henry fabric) set the mood for her funky pink red black and white palette. So cool! TEXT! 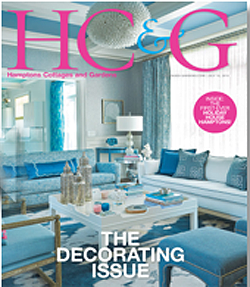 The Florid Bloom pattern is set apart from the color fields with text fabric color words dancing all-around! Start with a plan... I was informed she had to have a plan when she starts a quilt, I cam back and she took liberties with her points! (Hehe, My kind of plan! Who says a plan can't be changed!) 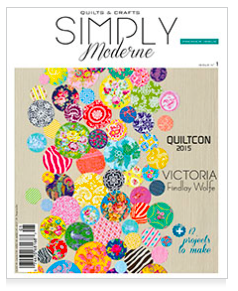 A quilter after my own heart! The dot fabric in the points, give amazing movement... Great choice! Jonathan who works at the Museum was my classroom helper, and also was taking the class... 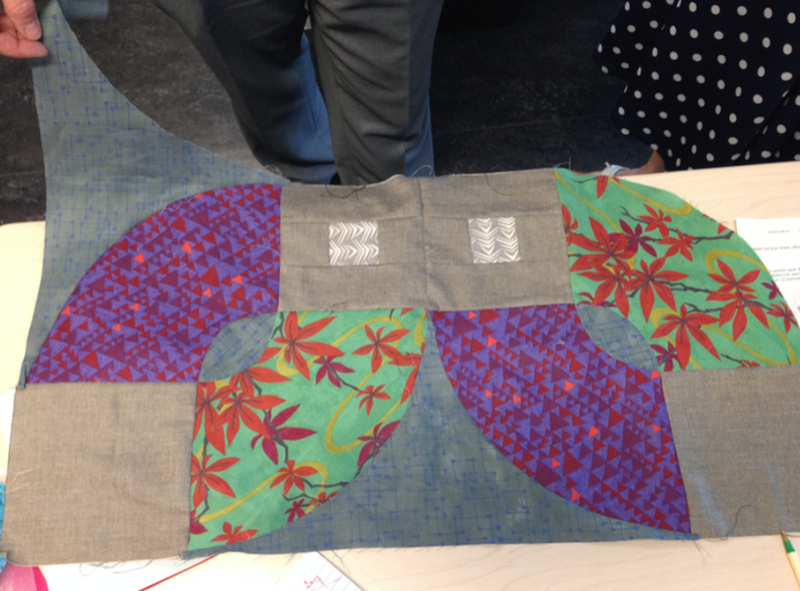 He ran out and bought a bunch of new fabrics for his project, and included a chambray, which he had not used before....The sheen it gave the quilt was a great bonus! Although I'm not sure he was thrilled with the chambray with the wiggling... (Chambray is wiggly to work with... ) Patience grasshopper! ;-) It's fabulous! Stick with it! 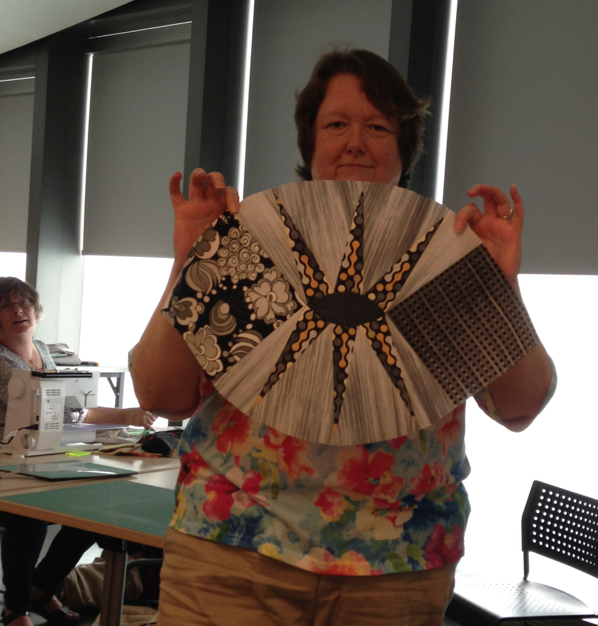 We had one gal who was new to paper piecing... I walked her through the first one, giving her permission to hate it. LOL... 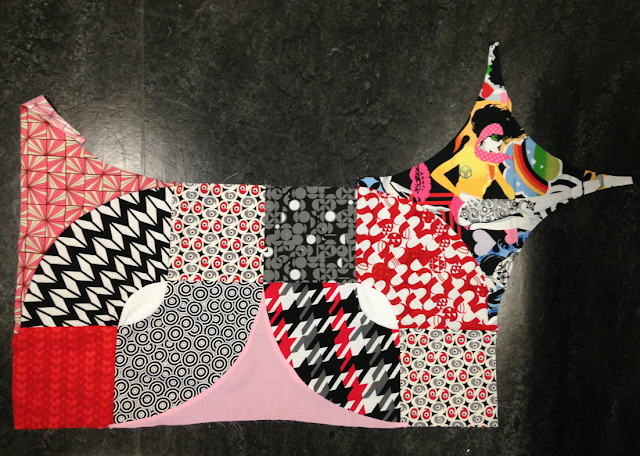 It's brain twist when you start... She finished her first one, and said, maybe I will just go cut full pieces and forget about paper piecing... I came back around and she had three arcs done... Now she is addicted! She even went home and did a bunch more. Makes me itch to start another myself! PLAY! Of course there was playing going on... What else can you do to change up the pattern to make it your own? This yummy palette maybe getting some adapted corner squares... Lovely. And lastly, My own Double Wedding Ring Exhibit is up until June 28th... 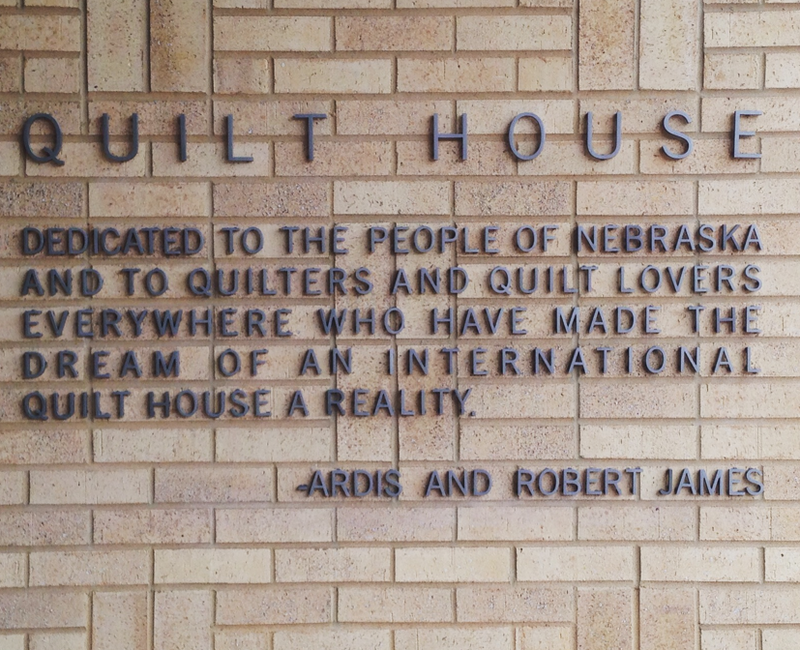 It's been the biggest honor to have them hanging in the Pumphrey Family Gallery at the International Quilt Study Center...AKA, QUILT HOUSE. If you get a chance, might you consider becoming a member of the museum? Your small contribution goes a long way. 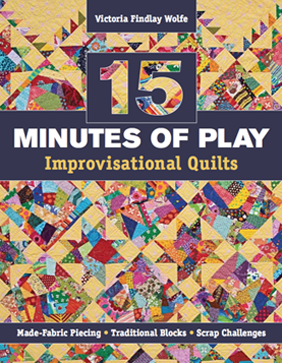 It's a great place to visit,, and see some amazing quilts from all over the world... You can also check the ONLINE collections... INSPIRATION GALORE! 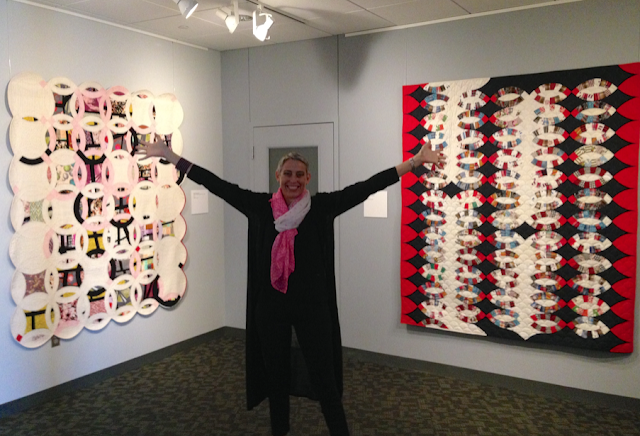 I thank the Museum for allowing me the space and time to share my work. My special babies... 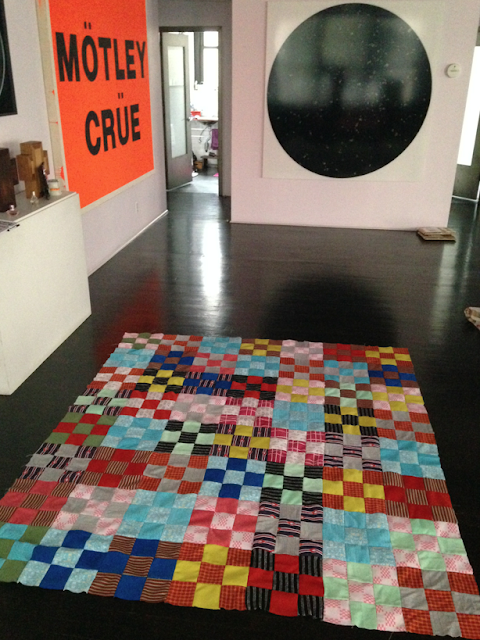 These quilts were an exploration of JOY, and Joyful I am.... I'm ready to start my next project... I just need more time!!! I know with social media these days,we breeze in and out of blogs, But I still love hearing your thoughts. I see how many people visit my blog each day, but I rarely get to hear your comments any more... Thank you to those who regularly post comments! It's much appreciated. Do you miss my videos? Your class made some great arc's. Glad everyone is having fun! 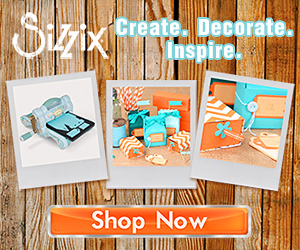 Such fun, color and inspiration going on! 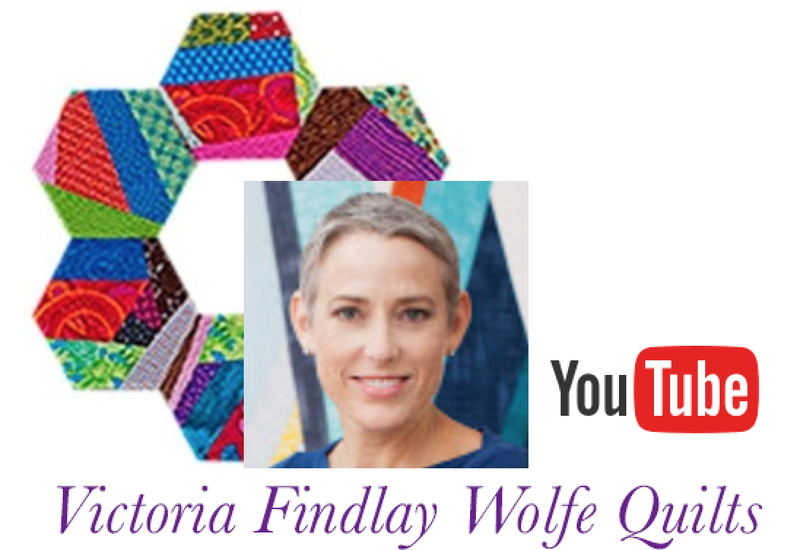 Hope to get into one of your session at Quiltcon West when enrollment opens next week. And I love your little videos Victoria so am glad you got a new phone, I did too! 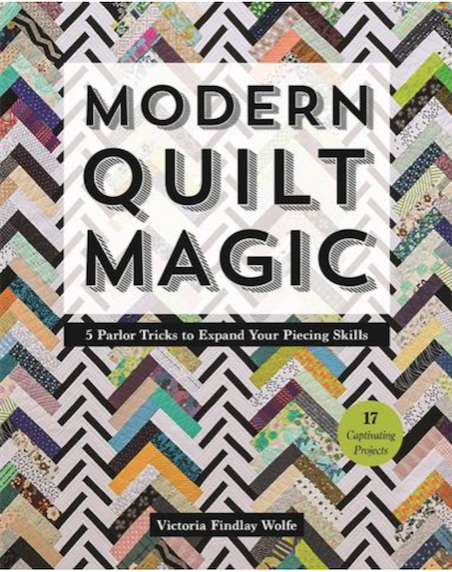 Hope to see you at Quiltcon!! Yay! Those are some fabulous DWR blocks, pieces and parts! I have never made a DWR anything. Taking a class from you is at the top of my list. I was out of town both times you were in my area. Those pictures are just what I needed this morning! After meeting you and buying your DWR book in Vero Beach earlier this year, I came home and immediately started making the arcs for Bright Lights Big City. There are 25 or so on my design wall, and I really must just jump back into this process again.....today!! Thank you for taking the time for us to share your talent. I check your blog everyday. Never thought about posting that often as you are a busy woman to read all those comments. Thanks for sharing again. I love the "adapted corner squares" idea with more points. 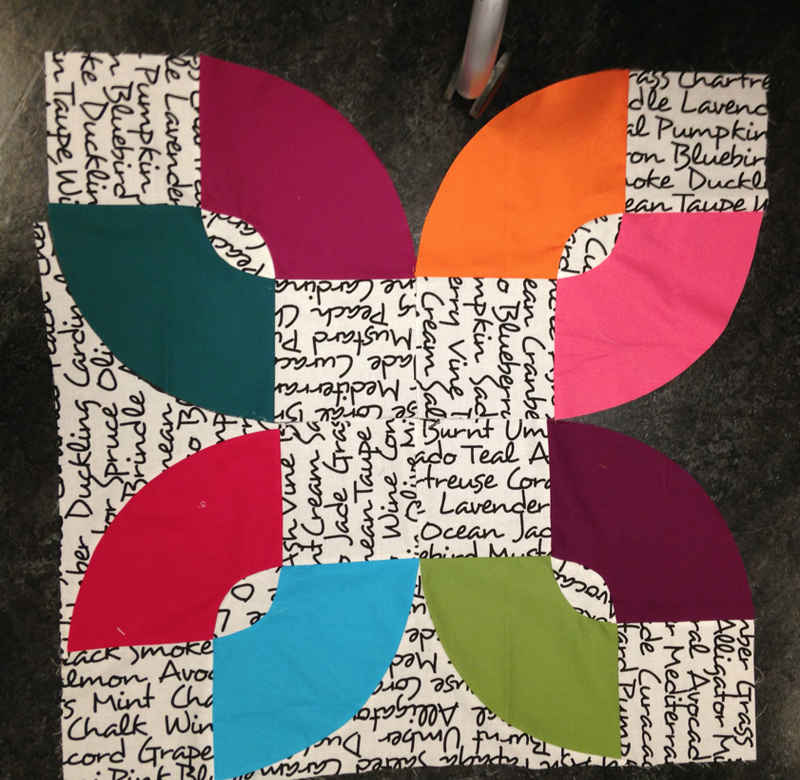 I've made Kaffe Fassett's version (from Quilt Romance); a lot of fun (and a lot of work)! Great pictures & commentary on some beautiful work, V! I miss your videos. Lovely to see the photos of your class, Bright Lights- Big City is one I really would like to make a start on, I always flip to that page first when I look at your book! Yes, I do miss your videos very much, I was so pleased to read that there will be more coming soon. 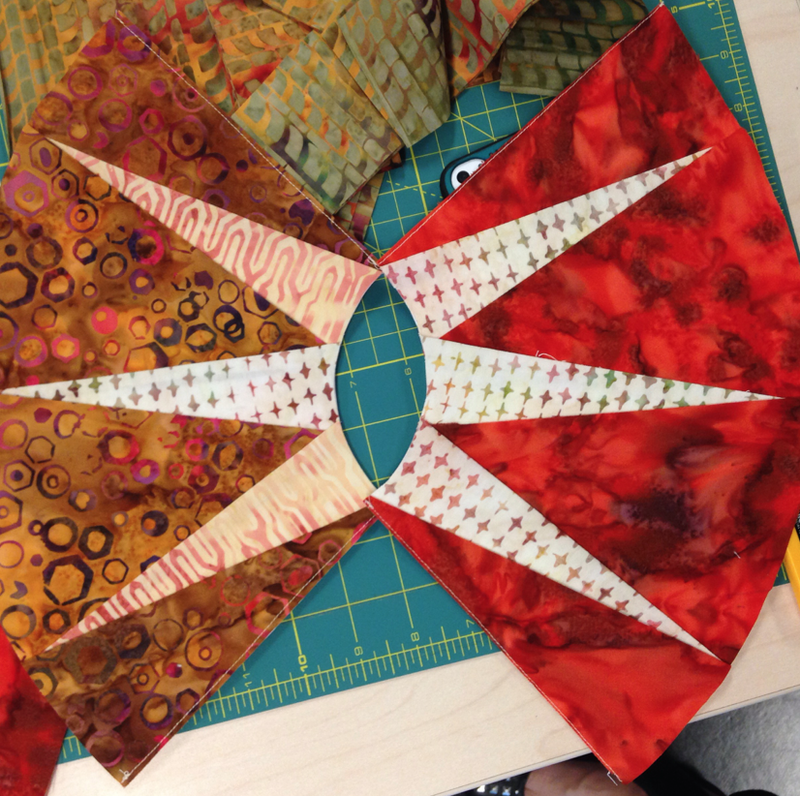 I have begun cutting with your stretched hexie and tumbler - great!! Thanks for being long time followers! I appreciate the comments! Love seeing what you're up too V! Bring back the videos too! Can't wait to get started on my DWR extravaganza. There's a few in the pipeline! The classes look fabulous, wish I was closer to take one! What clever students! Their blocks look great. No doubt they all benefited from their wonderful teacher!! Yes, I've missed your videos - hope you get a chance to do more. Hi, thanks for showing the work from your classes. I've also missed your videos over the past months. 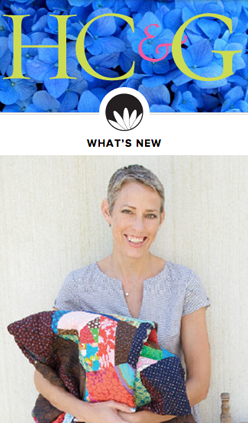 You and your quilts look great and the class looks like such fun. I think you could have deleted the old videos from your phone, just saying. a new one after my contract ran out. I keep coming back because I love seeing what you are working on, your wonderful finished projects and what your classes are doing. I also enjoy reading about your life and family in NYC as well as your travels. I'm bad about not commenting much on blogs and will try to do better! 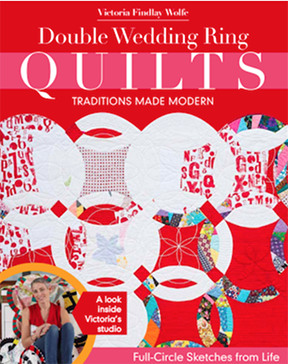 I've never made a double wedding ring quilt, I always felt it was too intimidating but you make it look possible. I've missed your videos and look forward to seeing some soon.?? 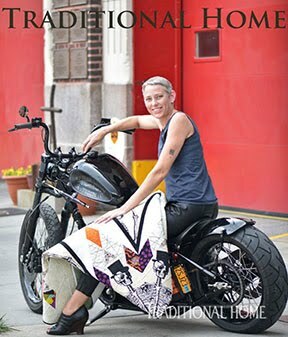 I sure wish I lived closer, I did enjoy your time on The Quilt show. I love watching what is happening in your classes. So many loosen up and let their creativity out! 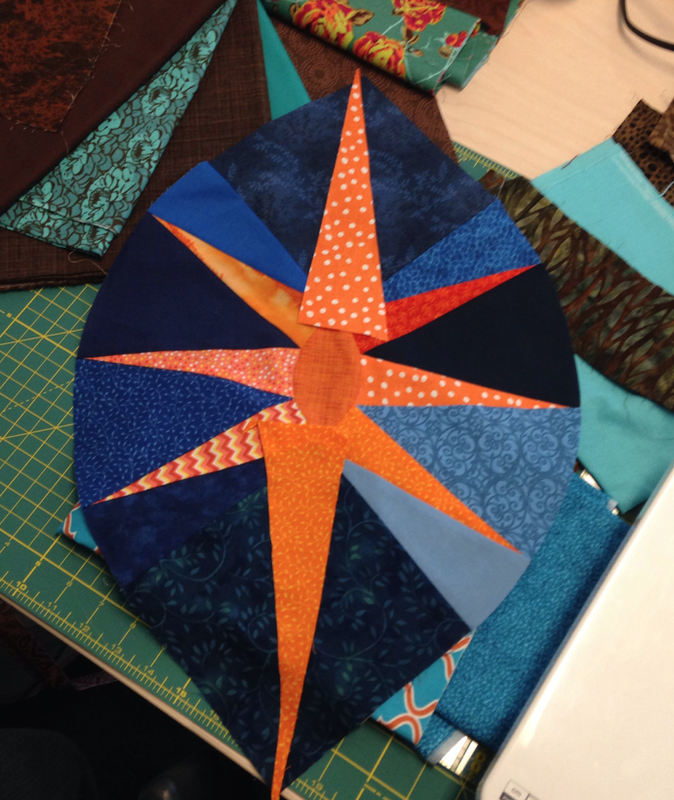 I have had one of your classes already, with two more coming up with the Warwick Valley Quilt Guild and am so excited! You are a great teacher, full of the special 'know-how' to share your enthusiasm. Very inspiring! Thanks for sharing!